Presqu'ile was made for walking; its flat terrain and views of Lake Ontario attract walkers all year round. A favorite route for many is the paved one-way driving loop (Lighthouse Lane and Paxton Drive) around the peninsula. This road has a designated walking/bike lane and is ploughed in the winter. This is still a road however and walkers are urged to be cautious, particularly in the busy summer months. For those wanting a more natural experience Presqu'ile has 12 kilometres of traditional 'off-road' trails. All trails are clearly marked with coloured plastic blazes and are cleared of dead-fall on a regular basis. Two of these are interpretive trails with an accompanying trail guide. A third interpretive trail, the Marsh Boardwalk Trail, was totally reconstructed by volunteers in 2010. A summary of these trails follows. For a map outlining all these trails click here. This 1 km loop trail winds through an area that was once part of a farm settled by Thomas and Ezekial Jobes in 1835. This part of their farm remained relatively undisturbed by settlement activity and today contains one of the oldest deciduous woodlots at Presqu'ile. The trail passes by towering old maples, vernal pools crossed by boardwalks, conifer plantations, and an old field which is filling in with ash trees after a century of use by the Jobes family. An interpretive guide introducing visitors to the ecology of the Jobes' forest is available at the trailhead or can be downloaded by clicking here. The Friends of Presqu'ile refurbished the Jobes' Woods Trail, completing their work in November 2013. 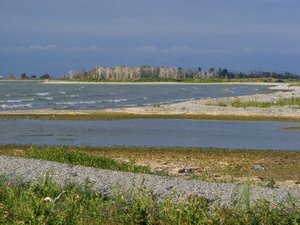 This 1.6 km loop trail offers excellent opportunities to see migrating shorebirds along the natural beach and distant views of the water bird colonies on their island nesting grounds. The trail can be accessed from the south end of the beach or from west end of High Bluff Campground. To avoid disturbing migrating birds the natural beach is closed to foot traffic between ice-out and ice-in, but the trail provides a number of lookouts allowing views of the entire shore. To protect the nesting water birds access to Gull and High Bluff Islands is closed from March 10 to September 10 inclusive. Gull Island can usually be accessed by foot after September 10 from lookout #5 of the Owen Point Trail. An interpretive guide to the ecology of the point and the islands is available at the trail-heads or by clicking here. This 1.2 km loop trail includes over 800 meters of boardwalk that takes visitors into the marsh. The Boardwalk has been totally rebuilt by the Friends of Presqu'ile Park and their volunteers, with help from Park Staff. The new Boardwalk is wheelchair accessible and includes three teaching zones, two viewing towers and a number of bridges and 17 interpretive panels. These trails lead you through the forests, plantations and old fields found in the heart of the Presqu'ile peninsula. Along these trails you will encounter a diversity of plant and animal life in the mature beech-maple forest, old fields and early succession forest which dominate this area of the park. The Pioneer Trail is 3.8 km long and marked by yellow plastic blazes. The Newcastle Trail is 4.3 km long and is marked by orange plastic blazes. The trailhead for both trails is halfway along Lighthouse Lane, though there are a number of other access points along both trails; see map. Please note that both trails use Park roadways for part of their length so be cautious of vehicles and monitor children running ahead on the trail. Bicycles are not allowed on any of the designated trails at Presqu'ile Park.